It seems as though we’ve blinked and suddenly we are already half way through the first month of 2019. We’re at a point where the phrase ‘Happy New Year’ probably isn’t relevant anymore, but seeing as this is our first blog post of 2019, we’re throwing caution to the wind and saying it anyway – Happy New Year all! 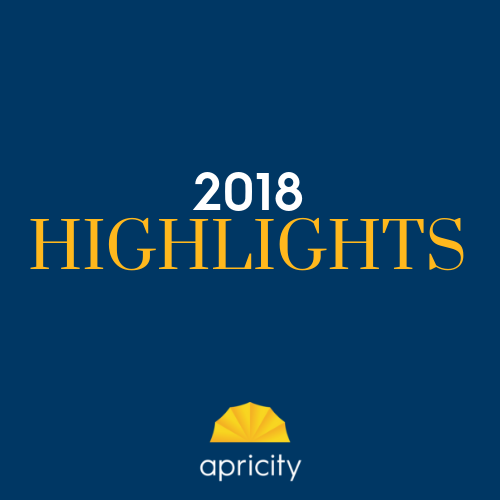 2018 was a tremendous year for Apricity and will be looked back upon as especially significant for us, as it was our first full year of business. We’re incredibly proud of how far we have come in the last 12 months – we have well and truly found our feet and are anticipating a full and exciting future for Apricity. We’ve popped below a few of our favourite highlights from the past year and in the upcoming weeks we will be looking forward to what’s coming up in 2019 – passing on our predictions on the world of finance – so keep an eye out for that. For now, enjoy reflecting over the last year with us and here’s to a fantastic 2019!